Mission CISD students listen to inventor Jack Andraka talk about his research for inexpensive cancer tests Friday, January 19, 2018, in Mission. 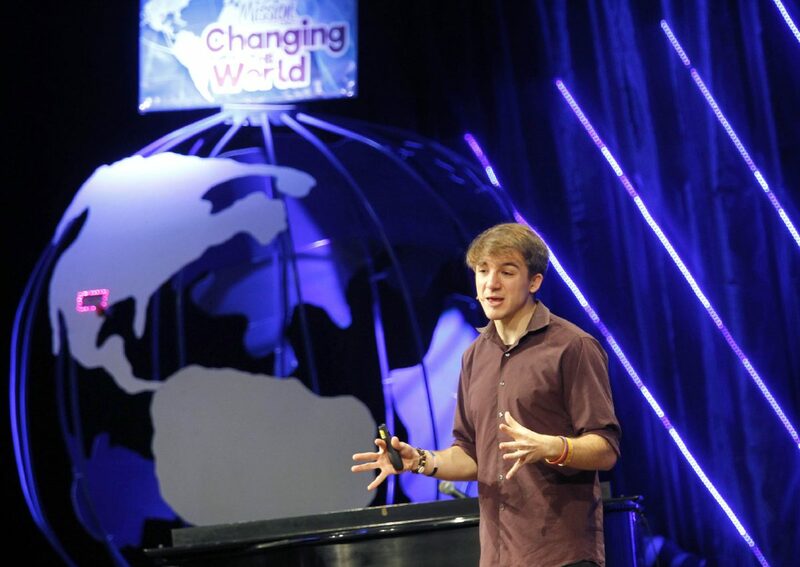 MISSION — At only 15 years old Jack Andraka developed a prototype of a sensor that could help detect pancreatic cancer at an early stage, a two-year quest now in the process of being tested and could one day be implemented in hospitals across the nation and even the world. Andraka is 21 now and pursuing a double major in electrical engineering and anthropology at Stanford University, but he still takes the time to tell his story to young students in hopes they can get inspired to pursue their dreams. His latest visit took place in front of about 2,000 Mission school district students grades fourth through ninth, who for the most part are involved in STEM activities – Science, Technology, Engineering and Mathematics. This is Andraka’s favorite audience, he pointed out. Inventor Jack Andraka talks to Mission CISD students on his work on a test for cancer Friday, January 19, 2018, in Mission. For Andraka the curiosity to search how to best test and diagnose pancreatic cancer began as a close family friend died due to late diagnosis of the disease. He didn’t let his age and lack of experience deter his curiosity and sheer drive to find answers, so he embarked in a self-driven quest to find a way to increase the chances of survival for pancreatic cancer patients through early detection. After developing a prototype of a small paper strip that detects a specific protein in blood, he reached out to about 200 professors hoping for the opportunity to use their research labs to develop his study, he said. While he was expecting responses applauding his progress, reality hit when he received critiques and 199 declines. One professor, however, Anirban Maitra at John Hopkins School of Medicine, opened the doors of his lab to the then teen. After many trial and errors, at the age of 15 came up with an inexpensive method to test for this cancer, which is now patented and licensed to a pharmaceutical company that could take it to the market after FDA approval in five to 10 years. STEM teacher Roy Villanueva, of Mission Veterans High School, said the talk resonated with him as one of his goals is to push his engineering students to find solutions to their problems on their own. Most of his students participate in robotics, he said, and the main idea of all the tasks they are presented with revolves around finding solutions. It is that self-driven mentality that Interim-Superintendent Criselda Valdez was hoping to project with this visit, as students witnessed what can happen if they set their minds to something they are passionate about. Any STEM field, Andraka said, has the potential to create positive change in someone’s life and many times it’s about students being exposed to those possibilities to have that seed planted in their minds.